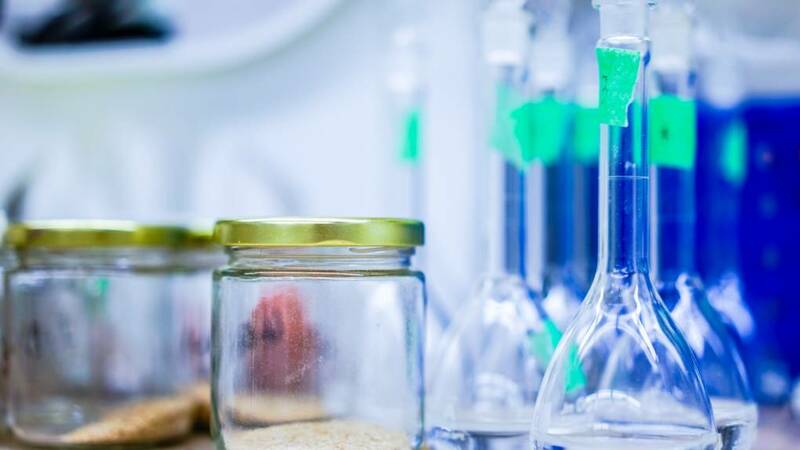 In my last KQED In the Classroom article entitled, “Snapchat Worthy Science Lessons Connect and Engage an Entire Class,” I shared a Chemistry lesson that encouraged the use of Snapchat to inspire students to “snap” Chemistry lessons to share with their peers. However, trying to find other teachers that used Snapchat was not easy. Most of the teachers in my school believe Snapchat to be the nefarious cousin of Instagram. Their perception of Snapchat was so negative that many of them simply refused to use it in their classroom — for any reason. But Instagram seemed more well-intentioned according to many teachers. When I mentioned the possibility of using Instagram as a way to digitally maintain a student portfolio, the teachers were interested in learning more about it and how it could be used in the classroom. As an Instructional Coach at a large, urban high school, part of my job is to help teachers find engaging and motivating ways to help students connect with that which is being taught. What can I do to support teachers in finding engaging opportunities to connect with students? In addition, how can I help to transfer those opportunities to other content areas? To that end, a Chemistry teacher and I recently teamed up to utilize Instagram as a means to create and implement Chemistry portfolios in Science. We began to explore the possibility of creating Chemistry lessons uploaded to Instagram that students could watch at home for extra review and study. Students could have ownership over their learning; they could determine when and where to create their digital narratives; and they had the freedom of when and where to view their peers’ portfolio. In addition, they would be encouraged to comment on each other’s work thereby prompting critical feedback and critique. This type of choice is indicative of 21st-century learning; giving students opportunities to make their learning meaningful to them. 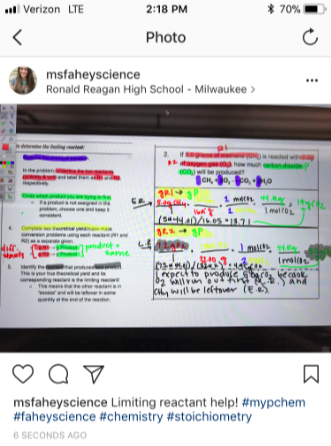 Therefore, in an attempt to have students engage in creating a digital portfolio, the Chemistry teacher began to use Instagram as a way to permanently document their learning. After creating an Instagram account specifically for classroom purposes, she had students follow her by posting her username on the board. One of the major benefits of Instagram is that following is one-way. As the teacher, she could not see any of her students’ posts on her feed, since she did not follow them. Then, as her students completed various activities, such as lab-based inquiry, group work or practice, she encouraged students to snap a photo or video (if modeling a problem) and post it on their Instagram account using a prescribed hashtag (i.e. : #mychemstudentinitials). When the hashtag is clicked, students can access not only their photos and videos, but also the photos and videos of other students. Then, as a review, students can pull up their digital Instagram portfolios and see visual clues that might inspire better recall prior to an assessment. In addition, when searching for the hashtags, the teacher can quickly pull strong and weak examples from random students and work with those students who need more specific support. Create a professional Instagram account (i.e. @msfaheyscience). Post the Instagram handle on the board. Encourage students to also create a professional Instagram account, modeling your Instagram handle: (i.e., @student’snamescience). Ask students to follow your professional Instagram account. Encourage students to take photos and videos using the prescribed hashtag. Refer and reflect on photos and videos taken. It is imperative that students follow the professional Instagram account. That way there is no concern regarding the unprofessionalism of the account. The account remains specifically used for classroom use and students have the opportunity to see photos and videos from that account only. In addition, this also gives students an opportunity to practice managing a professional account. What might Instagram portfolios look like in other courses? Imagine students using an Instagram Portfolio when recreating scenes from a drama in English class or giving a presentation about an artist. The scenes and presentation can be uploaded, with the prescribed hashtag, for student comments, again supporting critical feedback and peer evaluation. What about the possibility of using an Instagram portfolio as a formative assessment tool? Students can upload their responses in creative ways, sharing with each other what they have learned. For visual students who have difficulty using the traditional method of paper and pencil responses, an Instagram portfolio could be a way to capture their thinking. In closing, we know there are many ways to connect with students. Using social media, such as Instagram, is just one way to create engaging and motivating learning. Designing, utilizing and applying digital portfolios gave students an opportunity to connect in a way they felt comfortable – empowered by choice, challenge and change. (Special thanks to Ashley Fahey, Chemistry teacher extraordinaire who shared with me her use of Instagram technology in her classroom).